Interest groups are rarely portrayed in a positive light. In economic theories of regulation, collective action, and rent-seeking, interest groups are commonly perceived as seeking some form of redistribution through a political process. For example, the economic theory of regulation advanced by Stigler and Peltzman has been called the capture theory of regulation to reflect the idea that interest groups exert influence over policymakers, effectively capturing the legislative process. Although Olson’s work on the logic of collective action concentrates on the inner-workings of interest groups, it also develops a rather negative view of such groups as seeking protection for members, leading him to later declare that interest groups stifle economic growth in societies where they proliferate. A few theories argue to the contrary; interest groups can be beneficial in the provision of public goods in instances where markets fail to provide them.6 However, interest groups in the private sector – business associations, chambers of commerce, trade groups, and others – are most commonly portrayed as lobbying for some set of benefits for their members at the expense of other groups, whether they are subsidies, trade protection, or price breaks. The transition process in Central and Eastern Europe in the late 1980s to early 1990s brought to the forefront a new set of questions in regards to the role that interest groups can play. As countries began to explore free markets and mechanisms to put them in place after decades of command-style economic disasters, private-sector interest groups emerged as primary participants in this process. In some instances, state-created chambers of commerce acted as guardians of insider firms’ interests in the political process. In others, newly formed business organizations sought ways in which they could solve the collective action problem and engage the nascent private sector in the policymaking process. 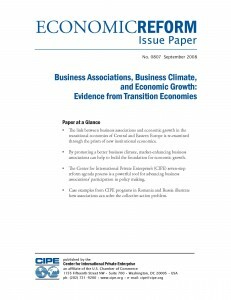 The success of these countries that restructured fundamental institutions and built new ones is becoming increasingly evident.7 For example, countries in Central and Eastern Europe are rapidly moving towards full integration with the global economy, while Central Asian countries and some other former Soviet Republics are increasingly isolated. In many cases, private-sector interest groups were participants in successful reform efforts. Acting as the liaison between policymakers and economic agents, business associations and chambers of commerce channeled information and reform recommendations from businesspeople, facilitating the development of a business-friendly environment. These associations emerged as engines of economic growth and development, seeking to increase the size of the economic pie through the political process, rather than simply trying to capture a larger share at the expense of others. This paper explores how firms, represented by business associations, can provide information and create political support for rules that foster a better business climate. Global criteria used by the Center for International Private Enterprise (CIPE) is presented to identify market-promoting interest groups and a process to develop a business-friendly policy environment. A further look into the case studies of market-promoting associations in Romania and Russia provides concrete examples.